The meeting today featured District 5170 Governor (DG) Jeff Orth and his wife, Barbara. The DG visits every Club in the District at least once during the year. Today’s visit was #31 for DG Orth. 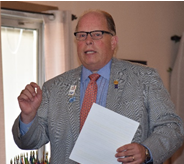 He also meet with the Board of Directors for an hour prior to lunch to share his goals for Rotary and to learn what the Club was doing. Information from that meeting will be included in the Board Minutes. DG Jeff Orth formally presented Todd Anglin with his Blue Badge. Todd earned his Blue Badge in less than five months as a member. Walt Schneider was Todd’s sponsor. Good work, Walt. DG Jeff Orth also challenged each of us to recruit a new member within the next 90 days and the clock is ticking. This year is the 100th Anniversary of The Rotary Foundation, which does great work throughout the world. Dwight Perry, co-foundation chair with Dan Willits, reviewed what TRF does and asked that all members contribute whatever they can to TRF. Members who contribute at least $200 are considered Double Sustainers. This year, DG Orth has created a 100th Anniversary coin to present to all Double Sustainers. 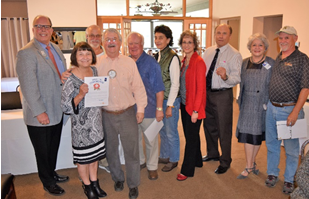 Since DG Orth is a member of the Rotary Club of Gilroy, he has created a special award with a proclamation and pin that he presents to Rotarians for Service Above Self. Dwight Perry helped create the pin. The proclamation for the Stinking Rose Award is You Stink! The award was presented to Ceta Dochterman, Bill Nott, Jim Negri, Dwight Perry, Margie Ramos, Heidi Hausauer, Gary Bosley, Carol Wikle, Randy Vanderbilt and not picture Obse Lubo and Ken O'Donnell for their year round valuable service to the club. One of the traditions in District 5170 is that the spouse of the District Governor (DG) identifies a project to support a need in the District or world. 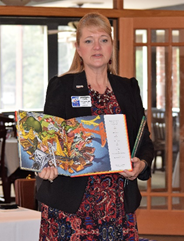 President Carol introduced Barbara Orth, the DG Jeff Orth’s wife, who is sponsoring the program Read Me a Picture that provides every low income, K-1 student with a book of famous artwork. Barbara has arranged a 50% discount on the price of the books with Barnes & Noble. All of the funds donated to this project by Club members will purchase books that the Club can distribute to Castro Valley students. Dawn Ortiz and Jim Negri each pledged $100 to the project. To make a donation, make your check in any amount to the Rotary Club of Castro Valley and give it to Todd Anglin at the next meeting or mail it to the P.O. Box. The Club will send the donations to District 5170. (More information is available at http://preview.tinyurl.com/ReadMeAPicture. 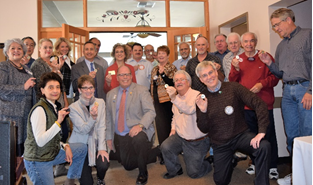 Each Club more actively recruiting new and younger members, which takes a different approach than when we became Rotarians. Each Club being more involved with Community Projects on both the local and international levels. All members to be more involved in the projects of the clubs (e.g., Breathing for Life). All Rotarians in this District in the forefront and participating in as many projects as possible for helping humanity throughout the world. He concluded his presentation with a short video clip promoting the District 5170 Conference on May 6-7 at the Santa Cruz Boardwalk. Details on the District 5170 website.